The European club handball season reaches its peak with three final events being played over the next three weekends, and all is set for an exciting prelude in Budapest where the best four women’s teams meet at the Women’s EHF FINAL4 2018 on 12 and 13 May. Two days ahead of the tournament’s start, EHF Marketing is reporting a record number of TV stations that will broadcast the Women’s EHF FINAL4 2018. 22 television stations - more than ever before since the inaugural event in 2014 - are set to bring the EHF FINAL4 to more than 55 territories. Audiences in countries without TV coverage don’t miss a second from the exciting matches in Budapest either, as all four games will be streamed live on ehfTV.com. Furthermore, EHF Marketing has joined forces with the Olympic Channel to live stream the semi-finals as well as the final. More than a dozen players, who won a handball medal at the Rio 2016 Olympic Games, will also take the court in Budapest. English commentary will be available both on ehfTV and the Olympic Channel. A full list of broadcasters is available at the bottom of this news release. Frenetic fans and top-class entertainment. A capacity crowd of 12,000 spectators will fill Papp László Sportaréna as CSM Bucuresti from Romania, Rostov-Don from Russia and HC Vardar from FYR Macedonia look to claim the title from the Hungarian defending champions, Györi Audi ETO KC. A successful title defence of Györ would mean the third top podium finish in Budapest as they also won the inaugural Women’s EHF FINAL4 2014. CSM Bucuresti came first in 2016, while HC Vardar are record participants with five appearances including the current event, but are yet to win the title. Russian side Rostov-Don are this year’s newcomers in Budapest. Besides the matches, top-class entertainment is guaranteed as British singer-songwriter, John Newman, has been confirmed as star performer. The musician will take centre stage at the Budapest event ahead of the final and will also be on stage after the trophy ceremony. Newman’s greatest hits are the UK No. 1 songs, 'Love Me Again' and 'Blame'. In the lead-up to the event, new companies joined the line-up of businesses using the Women's EHF FINAL4 as a platform to communicate with fans and promote their brand. HMD Global, the Home of Nokia Phones, is a new partner who joined in April. Through the partnership they will receive floor sticker exposure as well as LED board and arena cube advertisement. 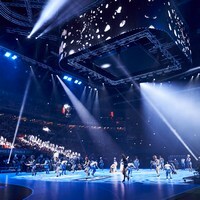 The company will also be present with banner advertising on the event website, www.ehfFINAL4.com, and European handball’s own OTT platform, www.ehfTV.com. Furthermore, EHF Marketing has extended its charity partnership with Plan International. Since the beginning of the 2017/18 season, the VELUX EHF Champions League has been supporting Plan International. Now, the Women's EHF Champions League is on board as well: Through advertisement at the EHF FINAL4, Plan International and the Women's EHF Champions League bring attention to Plan’s work and particularly to gender equality for girls and women. Launched at the draw for the Women's EHF FINAL4, the event’s official merchandise range, developed by Salming, is available online and at the EHF FINAL4 itself. The range consists of tees, hoods and socks for men and women and can be bought at http://merch.ehfcl.com and at Papp László Sportaréna on 12 and 13 May. All items feature exclusive details such as the woven competition badge as well as logo and trophy prints. The socks can already be purchased for €8, tees are €20, and the hoods cost €50.